That motion of kindness is relatively absent in their newest song, “Taman Shud”, the first single from The Drones’ upcoming new album. 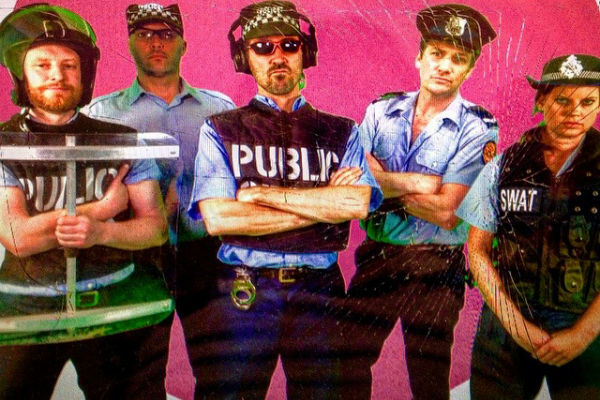 Ironically, the band are dressed as profound police, despite their song stalking around as a serial killer dedicated to slitting the throats of every right-wing pillar this country holds dear, such as our dearly departed Prime Minister and his policies. Even after all that boxing experience, Tone cops a scorching right-hook from a seething Gareth Liddiard, who also doles out righteous punches to everyone’s favourite pile of shits like Andrew Bolt, and Rupie Murdoch. Musically, The Drones file in right next to their furious gaze of Liddiard. Prickly guitar cackles shiver over the boiling rant, haunched on a sinewy frame, hackles raised and teeth bared to mirror the fearless leaders scathing, spitting tirade.